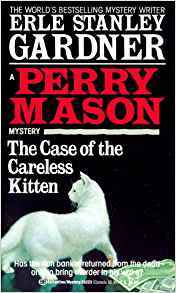 One of my goals is to read the complete Perry Mason mysteries. There are 85 of them. My connection to them goes back to my grandmother. As a child at her house, I remember her watching the show on her little black & white TV, although it wasn’t a show I could appreciate or follow as a child. Watching it today is nostalgic. Books, of course, are different from television and movies. And, reliably, the books are better, or at least much different. It’s especially true with this series. While the war isn’t mentioned overtly, the attitudes, more specifically, the prejudices of the era, are quite explicit. Uncomfortably so. A servant who self-identifies as Korean is referred to as “Jap” by a police officer. When that co-worker makes claims about that servant, Perry Mason uses the same sort of kind of language: “Those Japs certainly are clever. The Orientals know a lot about drugs that we don’t know.” This is surprising. Is this language Perry would use, or is he simply using the language to get into the confidence of this co-worker? I can’t imagine the Perry Mason of television saying anything like this. I have another five novels to go that were published during World War 2. It will be interesting to see if and how the language changes. In an earlier novel, I remember Paul Drake and Perry wanting to interview some witnesses. Perry tells Paul to talk to someone, Perry says, “I’ll talk to the Chink.” It makes you cringe. In 2018, the words feel entirely inappropriate and disrespectful. I can separate the attitudes of a character from his author, but it’s weird to consider a world where that was okay. Part of my attraction to the books (and the television show as well) is the anachronisms—cars, police methods, the unceasing and abundant smoking, which is startling to consider. Clearly, though, propriety in language has changed. For the better. There are funny expressions in the Perry Mason books. Della Street wakes up, pushes away the kitten she is taking care of, and says, “Not now, Amber Eyes. The strident clang of the alarm calls me to industry.” Not sure who talks like that. Apparently Della does. It’s hard not to think of the television personalities as you read the books. The one that doesn’t fit the description is Lt. Tragg, who is younger in the books than on television. While not explicit, Perry and Della’s relationship in the book clearly goes beyond the professional.